With your membership of either 6 or 12 months, you will receive a monthly shipment of a 24pc Collection of seasonal chocolate truffles. Intrigue Chocolate Co. is all about starting simple: with chocolate ganache. From there, they create world-class truffle treasures featuring some of the finest and most luxurious ingredients from around the world. With a large majority of their flavors focusing on the seasons, the Intrigue Chocolate Co. Truffle of the Month Club will bring you seasonal favorites and delights that you cannot find anywhere else. A monthly chocolate club that deals exclusively in fine chocolate ingredients and unique truffle recipes. While Intrigue Chocolate Co. 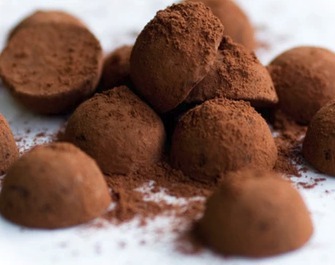 Truffle of the Month Club has excellent chocolates, the selection is limited to well, chocolate truffles. For most people, this isn't a problem. But, for those that want a lot more variety, they may find being limited to just truffles is too narrow. That being said, the truffles are not a same thing every month – in fact, they feature seasonal ingredients, exotic options, etc. So, members will receive a large selection and variety of truffles. Intrigue Chocolate Co. Truffle of the Month Club features some of the finest handcrafted truffles and ingredients. They strive to make those flavors that cannot be found anywhere else and these are not your garden-variety truffles by any means. They are made by a world-class chocolatier that uses only the finest chocolates from around the globe. Their ganache features very little sugar and they base their selections on farmers' markets and spice shipments that arrive to local shops – which means you may taste a flavor that will never be seen on the market again. There is only one chocolate membership with Intrigue Chocolate Co. Truffle of the Month Club. Each shipment contains 24 pieces of truffles. Members can select a six month of 12 month membership and then renew once the contract period is up. Shipping is part of the membership price, but for some people, being stuck in a 6 or 12-month commitment may be too much. There are no additional perks with this membership. The club sticks to only truffles and they do not offer any special discounts on reorders or any perks that go along with signing up. Intrigue Chocolate Co. Truffle of the Month Club does take shipping their chocolates very seriously. All chocolates are wrapped to prevent any bruising and placed in specialized bags with ice packs to ensure that they do not melt – even if they are shipped in the dead heat of summer. There are no state restrictions, but they cannot deliver to post office boxes due to the quality issue. Unfortunately the only membership offered by Intrigue Chocolate Co. Truffle of the Month Club is not necessarily ideal for a gift. While it may be something affordable for a few gift-givers, the hefty price and long-term contracts make it more ideal for self-purchasing rather than giving away as a gift. Also, there are no special offerings for those that purchase the membership as a gift. The website is very basic and there is limited information available about the clubs specifically. They do have information regarding the chocolates and the chocolatier, but members may have to contact customer service if they have specific questions about their club membership or club options. There is limited customer support and those that sign up for a membership will have to direct their questions to the local Intrigue Chocolate Co. store in Washington. There is a phone number they can call, but they are limited to store hours and may not find the in-depth customer support experience they are looking for when they do call in. Six Month Membership: Includes six months of truffle deliveries with 24 pieces per shipment. Starts at $288 for the contract. 12 Month Membership: Includes 12 months of truffle deliveries with 24 pieces per shipment. Starts at $576 for the contract period. While Intrigue Chocolate Co. Truffle of the Month Club has some high-quality, excellent truffles, this club is probably not for everyone. This club is best suited for those that are experienced chocolate eaters and willing to step out of the box of the norm. Also, you need to be a fan of truffles or at least be willing to eat them on a monthly basis. That being said, their ingredients are refined, but not super exotic. So as long as you enjoy chocolate, you will enjoy the shipments you receive from this monthly chocolate club. We really like the ingredients and process Intrigue Chocolate Co. Truffle of the Month Club has. We also like that they do not pack their truffles with a lot of sugar – which takes away from the natural flavor of the chocolate. We really enjoy the fact that they use flavors from farmers' markets and even local spice shops – which means you can truly try something you may never see anywhere else. We also like how each shipment comes with two boxes – one for you and one you can give away (or keep for yourself). For some, this is a pretty unique feature that makes the higher price worth it. We don't like that there is such limited information specifically to the club and that members must commit to 6 or 12 months in order to join. Also, if members have concerns, they will need to contact the local store in Washington, which may be an issue. A refined monthly truffle club. Intrigue Chocolate Co. is known for their sleek packaging and even more modern recipes. With their Truffle of the Month Club you can dive into exceptional flavors and seasonal chocolates year-round.